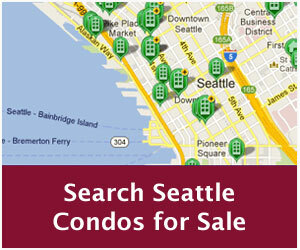 There have been talk of a slowdown in the housing market and Seattle’s condo market may be seeing evidence of that. Although, summer is typically is less active than the first half of the year so we’d expect it to be less robust. 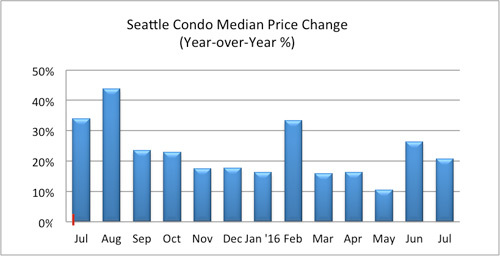 The citywide condo median sales price, on the other hand, continued to rise, increasing 10.76% year-over-year to $437,000. However, that was 5.9% below last month’s all-time record high of $465,000. 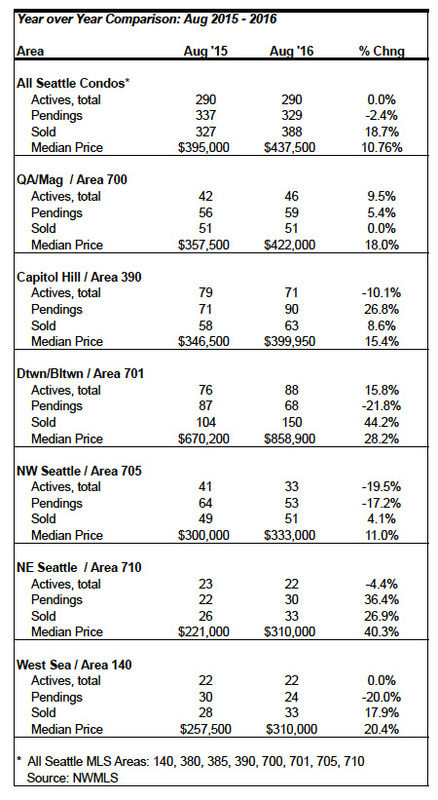 Looking at various neighborhoods by MLS defined areas, every neighborhood experienced double digit year-over-year increases in median sale prices with Northeast Seattle (+40.3%), downtown (+28.2%) and West Seattle (+20.4%) leading the way (see chart at bottom). 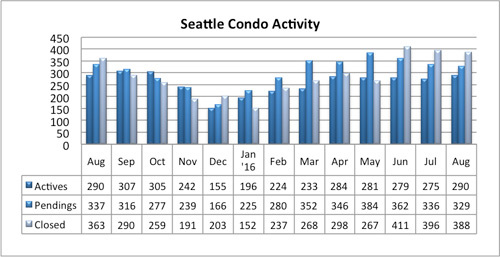 Inventory remained even with last August at 290 Seattle condo units for sale, though there were 5.5% more units available compared to July. 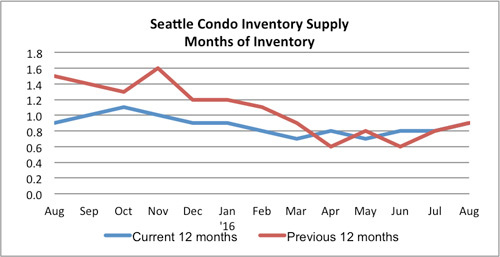 And, the inventory supply rate inched up slightly to 0.9-months of supply. 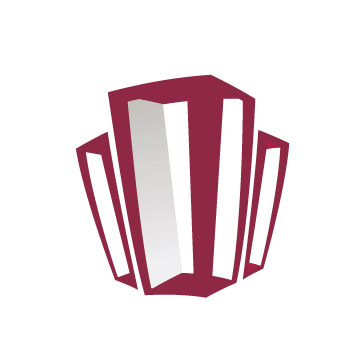 With most of the move-in ready new construction units having been absorbed with Insignia nearly closed out and LUMA 85% sold, inventory will continue to remain constricted for the next few years. The only other major project in the pipeline is Nexus, which itself is over 80% reserved and will not be delivered until 2019/2020. 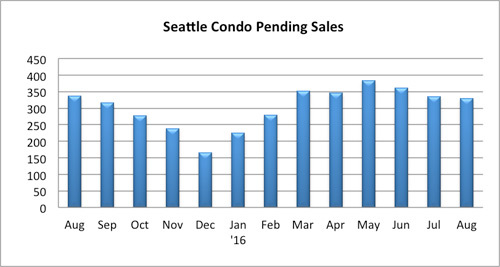 The slowdown was most noticeable with the number of condos going under purchase contract (pending transactions), which declined in August to 329 units, a year-over-year and one-month dip of 2.4% and 2.1%, respectively. 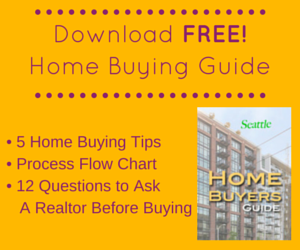 Cyclically, as we head towards Autumn and Fall sales activity will continue to taper off. 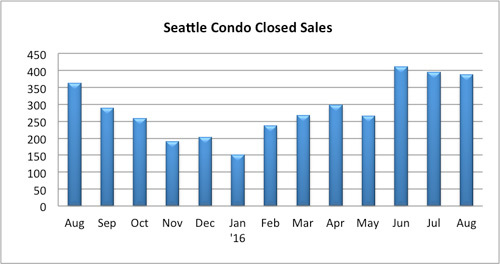 Fortunately, with the closings at Insignia, which made up nearly 29% of all closed condo sales last month, the number of closings rose 18.7% over the same period last year to 388 units. Though, that was 2% fewer closings than the prior month. The LUMA Condominium on First Hill finished construction and began closing in September, so we’ll see another active month for closings. 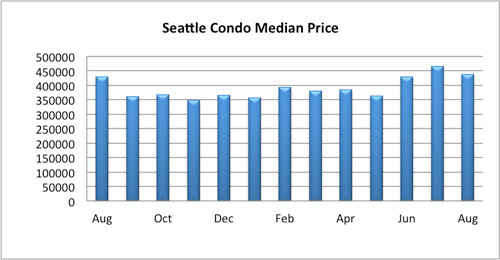 The downtown area median sales price skyrocketed to $858,900, which was due to the phase 2 closings at Insignia, which accounted for 66% of the downtown condo sales last month. Excluding those sales, the downtown median would have been $459,500.